Our range of products include straight line action clamps for food processing. We are the genuine manufacturer and exporter of Straight Line Action Clamps for Food Processing. We are expert in designing all kinds of Straight Line Action Clamps. Our products are available at leading industry prices to suit the budgetary constraints of the esteemed customers. 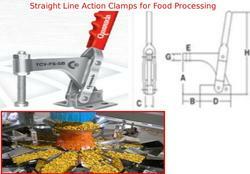 Looking for Straight Line Action Clamps for Food Processing ?